We host a lot of fun parties and backyard barbecues throughout the summer season and I'm always looking for a few cocktail and punch recipes that I can whip up and serve to my adult guests. 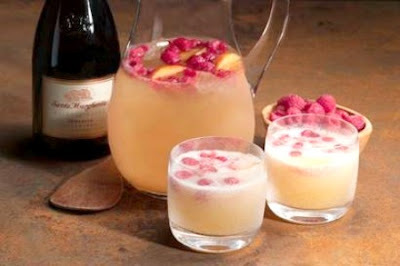 This recipe is courtesy of Santa Margherita and is super-easy to make. Once you have prepared the punch, you'll want to serve it chilled. The recipe will make approximately 10 servings. Looking for more great cocktail and punch recipes? Check out the sponsor's site for more! Place frozen raspberries in a large glass pitcher or bowl. Top with the peach nectar and Santa Margherita Prosecco Superiore DOCG. Fill remainder of the pitcher with ice cubes. Stir and serve cold.